See this girl of mine right here? When Veronica was teeny tiny, back when she was three or four years old, I'd sit with her while she was in the bathtub and sing. I sang scales, I sang silly songs, and I sang some of my old choir songs. She learned them, which was my intention all along. Eventually she could hang onto the melody while I sang the harmony. She could sing in a simple round. It was part of our routine to put on a little show while she played in the tub. She was not bad for being such a little kid. Fast forward to now, 6th grade. She chose choir as her elective at school. She's been coming home with all sorts of info about how to sing and support your sound, proper pronunciation, and so on. The first piece of music she learned was an audition song for All-State Honor Choir. She's never done anything like that before. Auditions have changed a bit from when I did it back in the day. We had to audition in person. Each choir member was recorded singing alone and her choir director submitted the audio online. Veronica recorded hers last week, and she told me she about had a panic attack. She took her time, but was in tears at the end she was so nervous. Last night we were out shopping and my phone rang. It was the choir director. I knew. I just knew!! She asked to be put on speaker to talk to Veronica also, and told her she had been chosen for All-State Honor Choir!!! This is so huge -- as there are only so many spots and only the best are chosen from across the entire state of Louisiana!! And my girl, who is brand new to choir, got in. Last night she came to my bedside and told me, "Mamma, remember how you used to teach me your choir songs? I think that helped me." Me too, baby girl. Mamma is super proud!! Situational Irony The difference between what is expected to happen and what actually happens. Discovered completely by accident, down the rabbit hole we fell once again and he has papillary thyroid cancer. It began during the summer with a neck x-ray at a chiropractor who noticed a spot on his thyroid. From there, he had an ultrasound, needle biopsy, and a malignancy result. Totally unexpected. Clint will be having the same surgery I had, but his is cancer and mine was not. There's a chance he'll need radioactive iodine ablation afterwards, but that won't be decided until after his surgery on September 17. 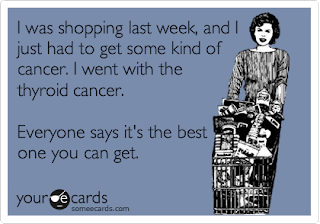 The doctors like to tell you it's the 'good' kind of cancer to get, as it is curable. 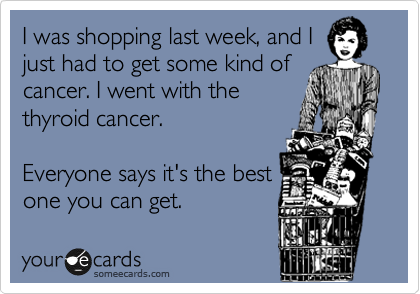 Cancer is cancer though, and nobody wants to hear they have it. The surgery isn't all that bad. It's just afterwards that is rough. 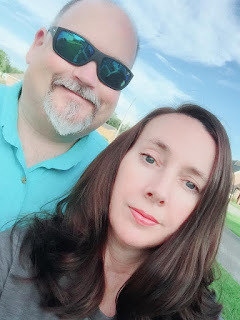 Life with out a thyroid isn't always easy, the first year or so is very difficult as it takes time to find the right dosage of medicine. Really, what are the odds of a husband and wife having the same surgery?? 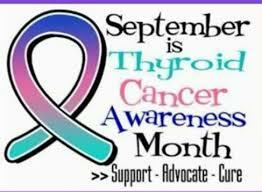 September also happens to be thyroid cancer awareness month. Well wishes and thoughts would be appreciated. 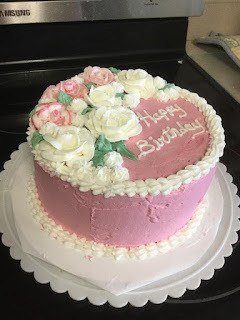 I celebrated my 46th birthday on August 30th! It feels a little crazy that I am somehow 46... but I'll take it! It was a quiet day. The kids were at school. I went to the gym and sat around doing not much of anything. 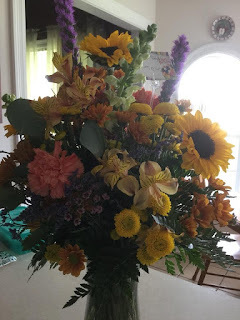 Clint sent me flowers. I got a few cards and a neighbor surprised me with a gift. We usually go out to dinner, but with it being a school night, we decided to do take-out. Clint ordered and picked up Texas Roadhouse for dinner. I also had baked myself a cake -- gotta have a real birthday cake on your birthday!! I somehow have put on a little weight over this past year. Not that I am overweight by any means but I definitely feel and see the difference. Slowing me down has been age, numerous medical reasons, and I'm seeing signs 'the change' is coming. I left my old gym a few weeks ago and signed up at the brand new Planet Fitness in town. I liked my old gym okay, but it was hard to pass up that $25 Black Card membership at PF! Lots of people knock PF for not being a 'real gym,' but so far I really like it. It's huge and has more than enough weight machines for me. The employees are nice and I've been greeted with a smile every visit. Hopefully this new routine will kick start my motivation to get this weight off.... here's to making 47 even better.